Apart from the music of Neyo and Maroon 5 that I always listen to in my PC here at the office, "Nothing's Gonna Stop Us Now” by Starship is part of my daily dose as well. It’s a good song…I like the lyrics and the upbeat tune. 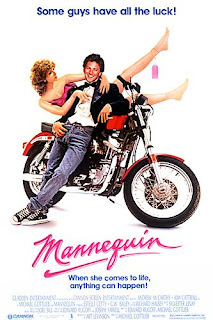 Whenever I hear that song, it reminds me of the movie Mannequin. Have you watched or heard that movie? It’s about an Egyptian princess cursed and reincarnated through a mannequin which was made by Jonathan (Andrew McCarthy). Jonathan has no idea that the mannequin named Emmy (Kim Catrall) comes to life when night falls. From all the movies that I watched during my youngster years, this is the one that I can't forget. Some critics in the US didn’t like the movie though. For them it was stale and made for dummies. But for me, it was a movie that I definitely want to watch for the 2nd time. Andrew McCarthy won the BEST ACTOR award for this film at Fantafestival. hay grabe, i love this movie nung bata ako. kakatuwa eh. I know sis Ü Meron kayang DVD original nito? Thet: Meron na kayang DVD copy nito? Hmm...gusto ko talaga yung movie na ito...hehehe.